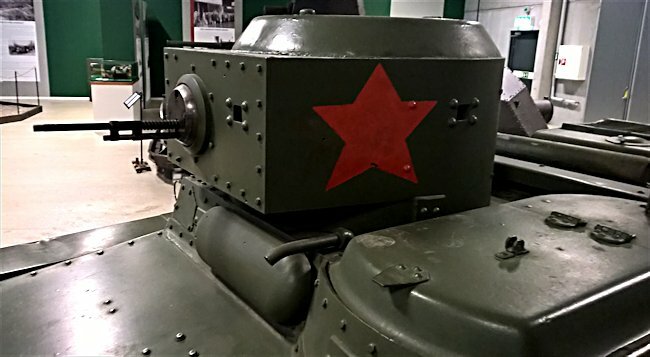 This Soviet T-37 Amphibious Tank can be found at the Arsenalen Tank Museum near Stockholm in Sweden. It is one of five remaining examples of the 1200 that were made. Soviet WW2 T-37 Amphibious Tank Tank captured by the Finnish and given to the Swedish Government to test as a thank you for their support in the war against the Russian invasion of Finland during WWII. 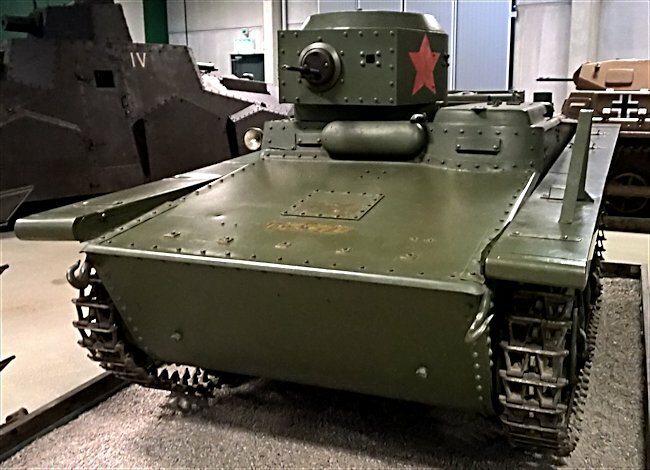 Russian T-37 Amphibious Light Tanks were built between 1933 and 1936. They were used by the Red Army in tank battalions of infantry brigades during the Winter War between Finland and Russia in 1939-40. 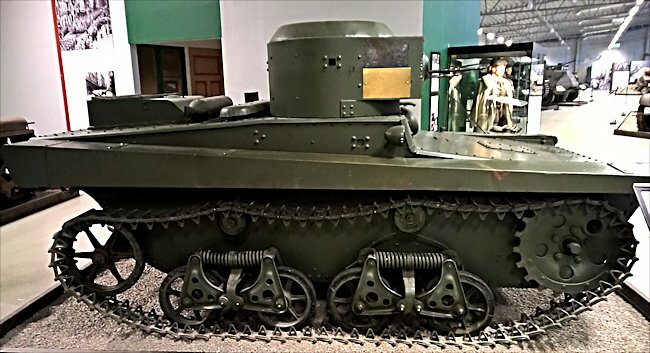 The Russians based this unusual tank on a British Carden-Loyd amphibious tank built by Vickers-Armstrong. Finnish soldiers captured this Soviet tank on 18th December 1939 during a battle with the Russian 273rd Mountain-Rifle Regiment near Pelkosenniemi on the Salla front. It was gifted to the Swedish Volunteers fighting alongside the Finnish Army in 1940. An additional antenna mounting indicates that it was used as a command vehicle. When it arrived in Sweden it was still painted in whitewash. This was removed and the Summer olive green Red Army colours were repainted during its restoration. 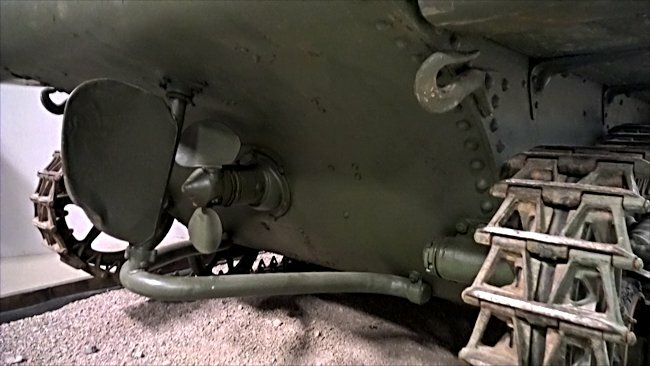 The original floatation bodies on the side of the tank had to be replaced during restoration as they had been damaged during the war. It was powered by a GAZ-AA 4 cylinder water cooled 4 stroke L-head petrol engine which was a Russian copy of an American Ford Type AA engine. It produced 44hp and gave a maximum road speed of 35 km/h (22 mph) and a water speed of 6 km/h (4 mph). It had a 4-speed gearbox. The propeller drive was engaged separately. The propeller was reversible. The rudder was controlled by a lever. The tank only weighed 3,200kg (7,100lbs). It was only armed with a 7.62 mm machinegun. It had a crew of two. The driver sat on the left of the tank and the commanders turret was on the right of the tank. Where can I find other T-37 Amphibious Tanks?